These days have been NUTS! I haven’t had time to do my Lilla Rogers bootcamp homework at all… so hope to catch up on that somewhere later in time. BUT, I’m really happy with the illustrations I did for Jamie magazine. More will be on my site soon, but check out the Italian edition that’s in store right now! Right now I’m on the look out for another, affordable and lovely studio, because our studio will close the beginning of august. Our studio is planning on closing down, and I have to look out to: working from home or working from another place. The biggest challenge will be: where to leave all my stuff! Everything has been piling up in the last few years, and it has to slim down big time. But there’s all these things that I think that might come in handy one day. And I have a really nice desk… which won’t fit in our home and is not welcome in a lot of pre-fab studio’s. Wonder where and when things will land again. Speaking about squirrels. 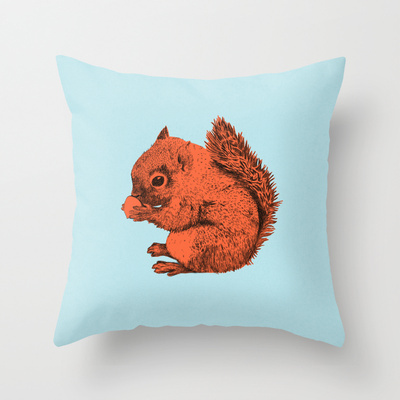 This one is for sale at my Society6 shop!